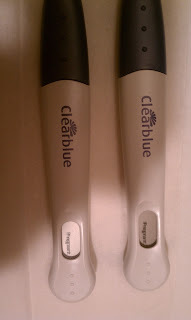 After We Tied The Knott...: Clear Blue Said IT'S TRUE! Let's start at the beginning (just FYI, when I say that, expect a long(er) post). Tyler and I knew we were ready. Despite all of the stories (that may or may not have been viewed as encouragement) of people who waited 10 years, or 15 years to have a baby... we were ready. I had some severe baby fever and when we thought about it, we actually had a lot working in our favor. It was late December when we went off "the pill" and although I have always had an irregular 'cycle' (sorry, boys... TMI), this one was different. I was tired, my stomach hurt, and I was tired (intentional double mention here). On top of that, I was 3 weeks late. Ding ding ding... there's an indicator! Tyler told me that we should go get a test on Wednesday (the 8th) but when we got it, we decided to take it on Saturday so he wouldn't find out then have to go to work. Valid, but I wanted to know now. Like a good little wifey, I waited. We talked about it on Friday night about how I should 'go' before bed so I wouldn't get up early. Well I did. Honey, I peed before bed. Right before we went to sleep, he put his hand on my heart and said "I think I feel two heart beats". Smarty pants. I think I may have had too much water before bed though (or I was just so dang anxious) because by 4am, I was ready to explode. I decided it was time to know. I rolled over and asked Tyler if I should go, and his response was "no, honey. Get some sleep.". I explained how badly I had to go and he said fine. I walked into the bathroom at 4:15, did my business on two of them and set them on the counter without looking so we could look together. Corny I know, but we are excited/nervous and it's our first one!! Why not do it together? I raced back into bed and talked to him for a while about what it might say. He ensured me he wouldn't be disappointed in me if I wasn't bearing his youngins yet. We finally decided to take a peek. Counted to 3, and pulled back the tissue that was covering them. Pregnant. That's all the little stick had to say and our life changed. I can't remember, but I think I said HOLY CRAP about 8 times. Maybe 12. You might not be able to read it, I may have been shaking and Tyler always stood in the light, but these things are straight forward. Pregnant or Not Pregnant. After a couple of minutes (and pictures), we headed back to bed. Tyler's first reaction was "we don't even have a baby and I'm already losing sleep". He seemed excited. After laying there for a while wide eyed and in disbelief, I told Tyler I was surprised it happened so quickly (the doctor said it could take a few MONTHS)! He said (and I want to quote this because it was hysterical) "I knew it would happen... I have good swimmers. Olympic style.". Again, too much information but it was SO funny! Then he said something scary. "You took two tests, I bet you're having twins". Not funny. Becca and I put mom through the wringer and I'm not sure I could handle it with the same grace she did! We took our first test exactly 8 months after our wedding. Pregnant. Went to our first appointment to meet our OBGYN on Valentine's day and found out we are 5 weeks and 4 days along with a due date of October 13th. And here we are, folks. We are having a baby. We just finished our first trimester. 12 weeks and 4 days. Do you know how hard it was to not blurt it out right away?!?!?!?! That is so weird to say. The projects I was doing a couple of weeks ago were our announcements to our family (siblings and parents). Watch for those soon! My husband had the hardest time not telling people too! I was more willing to wait in case we miscarried or had a problem, but he was ready to tell people before we'd even seen the doctor!! Can't wait for more updates!! Congratulations, so exciting! Sounds SO similar to our morning we found out! lol. Awe!! Congrats girl!! So exciting!! I just stumbled onto your blog, but CONGRATULATIONS! That's such exciting news! You had me smiling at my computer screen reading through your whole post (which made me look a bit silly, as I'm sitting at a coffee shop by myself!). Congrats! That IS great news!Babies are the best!